The kids mostly sleep through the night but every so often one of them cries and needs some comfort to get back to sleep. Last night Ashley kept waking to what sounded like one of the kids crying, each time it turned out it wasn’t and the sound wasn’t coming from their room anyway. We stayed in the marina so we could work on the boat the next day. The next morning she got up to take Ranger to shore for his potty break and found a baby seal with the umbilical cord still attached trying to get onto the docks and trying to nurse on the hulls of boats. The seal found a ski boat and was trying to get onto the outdrive to rest as the docks were just too high for her to get on. She’d get onto the outdrive, relax to rest and roll right off. She was so distressed, exhausted and clearly hungry. We devised a plan to partially submerge one of our kayaks so she could rest. Sure enough she got on after trying to nurse on the hull and rudder of Samadhi. She slept there about 5 hours before she disappeared. We like to think there was a happy ending and she eventually found her mom. Notes: We have new electronics and a new autopilot. We left Tyee at 8am and motored to Blake island. We anchored on the west side. We packed a lunch and sand toys and took the dingy around to the marina. There we played on the beach and had a nice picnic. We saw a herd of deer and a very brave raccoon. That night’s sunset was absolutely amazing. The next day we hiked around the island in the morning. After lunch and naps we went to the beach with Dan’s scuba gear. He went down and retrieved starfish, spider crabs and Ashley and the kids put them in a bucket to look at before Dan took them back to their homes. We left after work at 7pm. Ashley topped off the water tanks while Dan readied us for leaving. Wind was light and seas were calm as glass. Victoria and Alex spent the time traveling doing their normal climbing and swinging from the dodger. They pointed out every passing boat and ferry. They were very concerned that our mast was going to hit the narrows bridge. They were jumping and yelling as we rounded the final turn and Cutts island came into view. We dropped our anchor right as the sun went down and darkness set in. The kids were sleeping soundly in their bunks within twenty minutes of shutting down the engine. We spent the next day playing on the beach, hiking the short trail and basically having the entire island to ourselves. We saw lots of crabs on the spit about 5 feet down. We also saw many birds nesting. After leaving Friday Harbor we got a thorough soaking from an absolute downpour as we came around Shaw & Lopez so decided to drop the hook at Spencer Spit. We ended up having a double rainbow over the boat. It was cold after the downpour, though. Have I mentioned the boat doesn’t have heat? We also lost instrumentation (wind, depth and speed) so once we were anchored and had the propane heaters going (and took some rainbow pictures) Ashley got to work going through the new instrument set up to figure out the problem. She got them fixed but didn’t know how. We spent the next couple of days exploring the spit and kayaking to the rocks north of the spit to look at the seals. The most exciting thing for the kids was to stomp the geoducks on the beach and get sprayed back. They were curious to know what a geoduck looked like so Dan started digging with a large shell. He got ahold of the geoduck but it just kept burying itself. Ashley joined the dig. We got some some crabs, clams, and FINALLY after what seemed like forever we unearthed the geoduck. The whole was probably 18″ deep and just as wide, it was a fight! The kids took one look and went about their business. Ashley didn’t get a picture. We briefly stopped at Clark Island to play on the cliffs. We grabbed a mooring buoy since we’d only be there a few hours. There was pretty good chop in the mooring field. From Clark we headed over to Sucia. Our days there were beautiful and we dinghy’d over to Ewing Cove. From Sucia we went over to Jones. We fed the deer and took the Murphy Tree picture. Dan’s family has taken a picture in this tree whenever they visit the island since the 1980-somethings. We definitely couldn’t break tradition. Next was Friday Harbor, we anchored in the bay but it was pretty rough with what seemed like constant ferry wakes and it was pretty tight when we’d swing on the anchor. Dan & Ashley took turns taking showers in the marina facilities then we took off looking for something better. 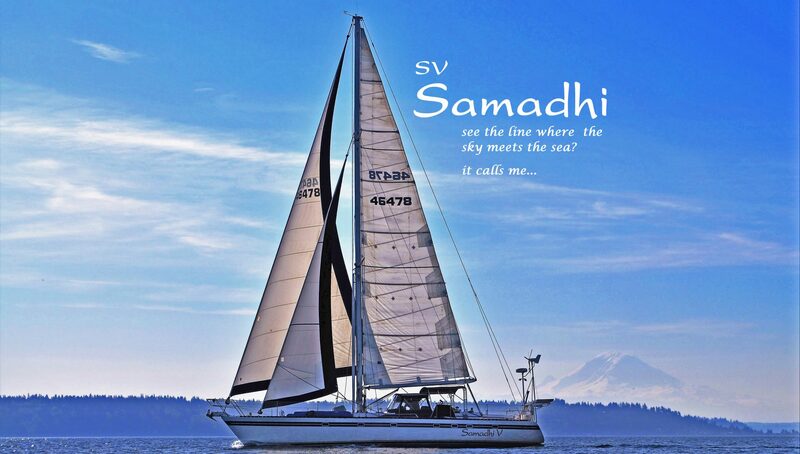 Notes: Our first vacation on Samadhi. We left Tyee at 0530 with the outgoing tide. No wind so we motored to Shilshole to top off fuel. We experienced some very rough conditions where Admiralty inlet meets the Straits of Juan de Fuca. We buried the bow a few times until we could turn away from the seas. The kids, dog and cat were a little nervous but stayed positive. We’d have the kids yell “we like big waves!” as we’d get ready to bury the bow. We passed Smith Island showing 31knots of wind though the VHF report 11 knots off Smith Island. We arrived at James island at 1600. It was Sonny’s first trip on the boat, he makes a pretty good boat cat. We had him on Bluestreak for a Blake Island trip in 2006, it didn’t go well… he’s definitely mellowed in his old age. We drove the dinghy from the west side of the island to the marina on the east side. There is a great beach on the south side that we love to play on. It was the kids’ first long dinghy ride and they did great even at the high speeds and occasionally jumping waves.